This will sound corny, but I actually envy people coming to Dublin for the first time this weekend. 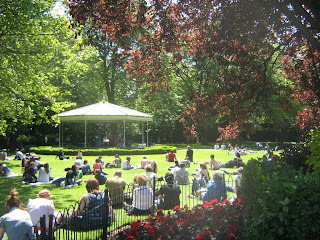 It's the weekend of the annual festival of street performance, it's amazing, it's free, and it's in one of the city's prettiest parks, in Merrion Square (home of the Oscar Wilde statue, affectionately known as "the quare on the square"). I went to this last year and it was hold-your-breath fabulous. Basically, street performers from around the world, including Ireland of course, descend on the square and put on astonishing shows. It's all out of doors, and it doesn't cost a Euro cent, and you can just wander about from one performance to the next taking it in. It's fantastic. 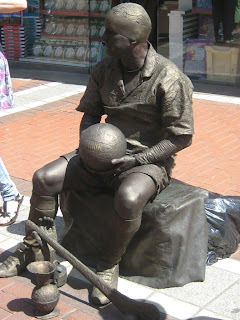 Ireland has a big culture of street theatre and I've never gotten tired of it. You can walk down Grafton Street any day and there'll always be people performing. I will be babysitting tomorrow, and it's going to be an easy gig, because all I have to do is take the kids to the festival and make sure they don't disappear. A week or two ago, I met an American couple on holiday here. Well, guess what, I was at work in the Dublin Tourism centre as a meet-n-greeter yesterday and they came back! To see me! They had been down to Clare and think they found the house their ancestor used to live in. It's all been a big voyage of discovery for them because they're African Americans and only recently started finding out about the Irish side of the family. I guess a lot of Americans must have similar experiences when they come to Ireland -- but it's quite moving to hear it directly from someone in the process of finding out about their family. Apparently, all the girls in their family are always taught how to make soda bread, and they never knew why -- it was just a thing they did. But now they know it's because of their Irish heritage! How cool is that? It's a fantastically glorious day, 23 degrees in the shade, apparently, and strangely enough it's on days like today that I think about the rain. Everyone knows that Ireland's famous for rain, and it's true ... it does rain a lot. But it's totally worth it, because when the sun shines, it shines down on bright green fields and mountains (in the countryside) and parks and gardens (in the city). Without all that rain, Ireland in the sunshine would be a lot less beautiful that it is. Even in the city, where most surfaces are paved, the cliched Emerald Isle is busting out all over. You'll meet Irish people who'll try to tell you that they're a restrained bunch, but that's nonsense. They're a nation of exaggerators, and you've gotta love them for it. For instance, everyone (or so it seems) has reacted to this lovely weather by running out of the offices and schools where they work, dashing to the nearest park, and tearing off most of their clothes so as to expose their lily-white Celtic skins to the sun. Maybe not the best idea, health-wise, but I've noticed more than a few tourists admiring the view :-) And that's not all: the sunshine seems to bring out the romantic in people. Stephen's Green is full to the gills of canoodling couples of all ages. It's enough to make a girl wish she had someone of her own *sniff*. 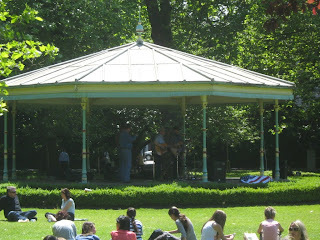 To cut a long story short, they couldn't have had a better day for Bloomsday this year. I can't believe it's here already! Tomorrow is Bloomsday, best day, IMHO, of the calendar in Dublin -- a day that celebrates James Joyce, literature in general, food and drink. Last year was my first. I LOVE it. So you've never read Joyce's Ulysses, this is a good time to start. The festival kicks off early tomorrow and I think anyone can attend the events -- only the hardliners do the whole thing in nineteenth century costume. Dublin events are good at catering to a range of tastes in general, and that's certainly the case here. While most of us might find the really detailed lectures too much, there are outdoors events in Temple Bar. I'm going to be working all weekend, but if I wasn't, there is a lot on. Viz. The Dublin Gay Pride festival, at which my Uncle Joey, flying the Newfoundland (and I guess the rainbow) flag for Back Home in Ireland. It never ceases to amaze me that he's actually living in this country now, when the first time he was here was just last year -- not to mention the whole out-of-the-closet thing. Fortunately, he's not staying over. My place is just too small, and I'll be working the whole time. But I am hoping to catch up with him at some point. I've just checked out the programme for the festival and I'm really quite surprised by how mainstream most of the events are - although I guess that's kind of the point. There's a big show on in the National Concert Hall. Well, the weather is amazing, I've been working hard and there's a bottle of white wine on my desk reminding me that I've been invited to a barbeque this evening. I promised to make potato salad -- my cooking skills are coming along but still don't get much more complex than that -- so I'm going to go and do just that. I've got some small, new potatoes from Moore Street and some fresh parsley from my favourite greengrocer -- who is also the host of the barbecue! Imagine being invited to a barbecue by your greengrocer! He and his family live in Malahide, out near the sea, so I think it's going to be great.